I’ve got a little sore throat. I think I’m coming down with a cold. I don’t think it’s the flu, though. I hope not. Anyhow, when you think you have a cold, what will you do? Will you go to the hospital? Probably not. When you have a heart attack or stroke, or when you’re badly injured in a car accident, then you’ll go to the hospital, or rather, you’ll be taken to the hospital. 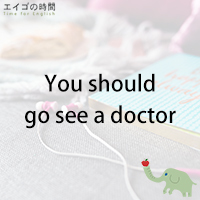 In English, you don’t say, “I need to go to the hospital because I have a cold.” When you have cold symptoms, such as fever, cough, sore throat, headache or runny nose, you’ll go see a doctor. If you know which doctor you’re visiting, you go see the doctor. I need to go see a doctor. You should go see a doctor. I’m going to see a doctor this morning. I went to see a doctor yesterday.